Anyone who is familiar with J.L. 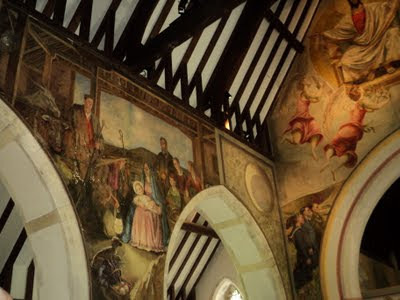 Carr's novel, 'A Month in the Country', will be aware that pivotal to the narrative is the uncovering of a mediaeval mural in a country church. For, prior to the Reformation, even the remotest of churches would have been decorated with wall paintings, the source of which most likely being traced directly back to Rome. And so it was that in 1941 Duncan Grant, a prominent member of the Bloomsbury Set, was commissioned by the then Bishop of Chichester, as a catalyst for promoting a new relationship between the Arts and the Church, to decorate the interior of the small Sussex Downland church of St. Michael and All Angels at Berwick. This much we knew, but no more. What delight, therefore, to be collected from our Brighton rooms most recently by our dear friends, Peter and Nigel, in their jolly pillar-box red motor car and swiftly transported through the country lanes to this jewel of an English church. And who better as guides and to set all within a context than Peter, a Canon of the Church of England, and Nigel with the wisdom and learning of his Catholic faith? Most striking of all is the Chancel arch where Christ, enthroned in glory, is surrounded by adoring angels whilst, lower down, the Bishop of Chichester and the Rector of Berwick gaze across the open archway to the kneeling figures of a soldier, a sailor and an airman, a strong reminder that Britain is at war. In the foreground scarlet poppies symbolise remembrance and resurrection. 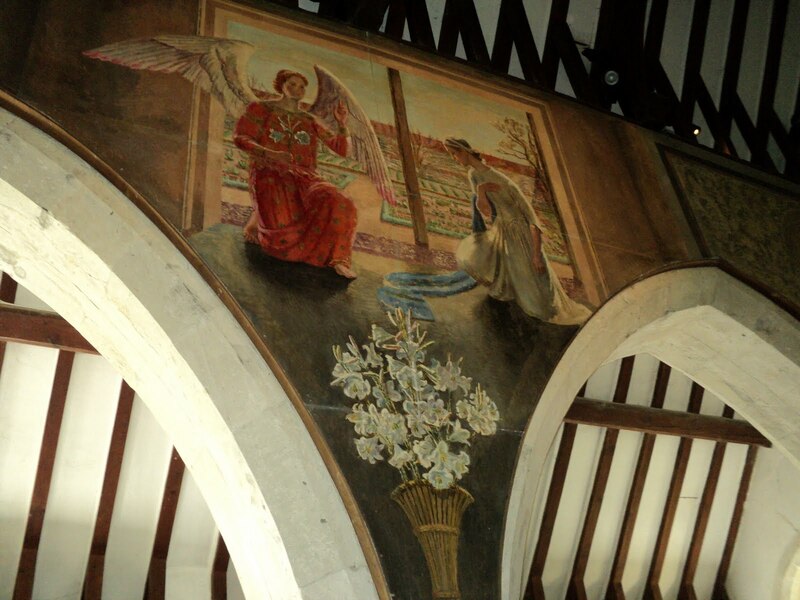 'The Annunciation', seen on the south wall of the Nave, is the work of Vanessa Bell whose daughter, Angelica, is the model for Mary, posed in Renaissance attitude and seen against a garden based on that at Charleston. On the opposite wall, also by Vanessa Bell, 'The Nativity' employs as onlookers the children, dressed as for school, of the housekeeper and gardener. A Sussex trug, alongside a lamb, adds a further touch of domesticity with its contents of winter vegetables. Time at Berwick has not stood still. 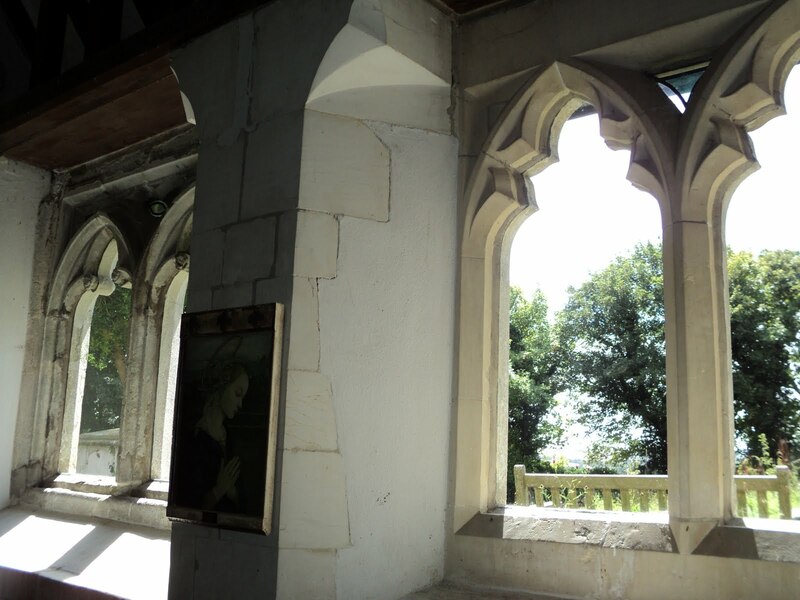 In addition to the murals, of which there are many, the inspired inclusion of clear glass to replace Victorian windows destroyed by bombs affords breathtaking views of the churchyard and countryside beyond, whilst flooding the interior with natural light. Newly installed oak doors, together with beautifully fashioned ironwork, have a profound strength and simplicity and are worthy twenty-first century additions. But, as if that were not enough, our day was, in fact, only just beginning. Following a delicious lunch at a nearby inn, we sped onward to Monk's House, the home of the writer Virginia Woolf, sister to Vanessa Bell, where the magic of both house and garden proved irresistible. And where, totally captivated, we lingered long. Then, as the shadows of the afternoon lengthened, to five o'clock tea in the little seaside village of Rottingdean where the ghosts of Kipling, Conrad and D.H. Lawrence forever mingle with the cry of the gulls. There is something very "of its time" about the church and it's 1940s murals, (and I mean that in obviously a wide sense, as I presume the church is pre-Reformation, but old in any case), and in a good sense, because there is something quintessentially English about the images you have portrayed. What a wonderful day out for you all. The paintings in the Church remind me of Lady Waterford Hall, Ford Village, Northumberland. Built as a school in the 19th century, it took Lady Waterford 20+ years to paint biblical scenes on the walls as teaching aids for the children...using the village inhabitants as models too. One day I will go to Monks House...it is on my "to do list"
It is of interest that the church was chosen for the murals as, apparently, it was considered as being of little interest and 'modern', although in part it does date back to the C14 if not earlier. The paintings, as you say, are very much of their time. Lady Waterford Hall sounds absolutely fascinating and something about which, when we spent time in Northumberland, we knew nothing. Now on our list of things to see!! Monk's House is, as you may imagine, Julie, most intriguing and well worth visiting as is, of course, nearby Charleston. You are right, Berwick Church could so easily appear on the pages of an Agatha Christie. Absolutely the right period. Fortunately no murdered clergy to be found but an exceedingly handsome rectory of 1846.
the murals are so beautiful, I find their colours just lovely especially the red/orange which seems quite prominent in the Annunciation and the Christ in glory and to which my eye was attracted immediately. We do so agree about the colours of the murals which retain a freshness and vibrancy even after all of these years. Monk's House was fascinating and not at all as we had imagined. The garden, in a cottage style with a huge vegetable section, seemed to stretch forever and included a wonderful 'writing room' in the orchard. The Berwick Church is so beautiful and peacefull. It is very strange for such a beautiful mural to see that in a small church like this. Here in Belgium, such churches are very rare or even nonexistent. Very informative and interesting blog post and I want to thank you for this. What a wonderful day in the never disappointing but this time amazing too English countryside. The Church I found weird for my taste, which doesn't mean I wouldn't have loved to be part of the little party visiting it, but having tea at Virginia Wolf's house, that I would have dream to do. Not that I would have mind to have tea in Rottingdean with the rest of the crew. Hello Jane and Lance - that sounds like a perfect day. The church in Berwick (I was thinking upon tweed when I first started reading!) is beautiful and, for me at last, the mix of old and new works beautifully. The clear glass windows especially are almost startling in their translucency and view. The murals of course are quite remarkable. How very generous and kind of you. Both the church and Monk's House were new to us and each one was equally fascinating and interesting. It was a wonderful day and entirely arranged, even down to the cream tea, as a surprise by our friends. Thank you, Jérome, for your very kind comment. 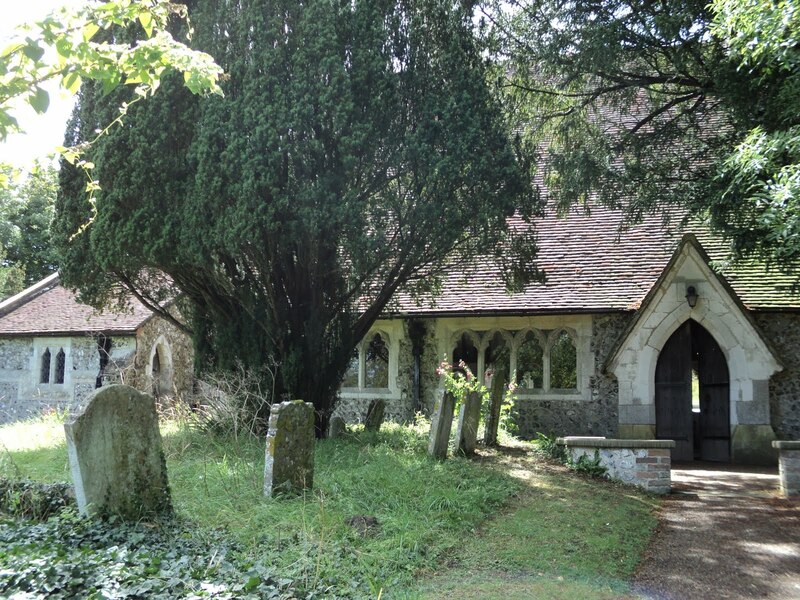 What is so surprising is that such a small church, tucked away in the heart of the Sussex countryside, should contain such treasures. We totally accept that the work of the Bloomsbury Group is not to everyone's taste, and how good it is that different things appeal to different people at different times. You will, of course, know only too well that stretch of coast between Brighton and Rottingdean with both the Windmill and Roedean School perched high on the cliff overlooking the Channel. It is an area which has, perhaps for obvious reasons, always held a fascination for artists and writers. We are so pleased that this post brought you back happy memories. It will come as no surprise to you that we at Nilly Hall are avid fans of the Bloomsberries. We love their art, their talent for home-decorating and we envy their bohemian life-style. Your super photos make us long for our next expedition to the Beautiful South! What is so good about Berwick Church is that it has not been allowed to become a time capsule nor, in any sense, a museum. It is very much a 'used' church and, we feel, wonderful that the present rector and congregation are contributing to its history in the present age. 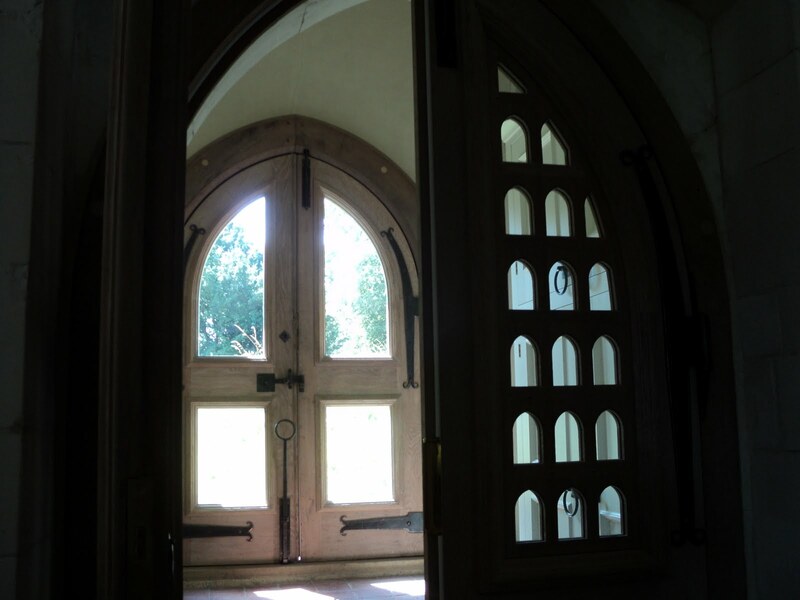 The oak doors do, in fact, need to be seen for their superb craftmanship. We do so agree and, as we have remarked to Craig [above], a truly outstanding piece of modern craftsmanship. Every detail, and of the ironwork too, is demanding of attention and study. No, we are not at all surprised, but are, of course, delighted. What wonderful lives to have been surrounded with artistic and intelligent people and to have been able to employ such creative talents in day to day life. This sounds like a wonderful day, a simply stunning church. 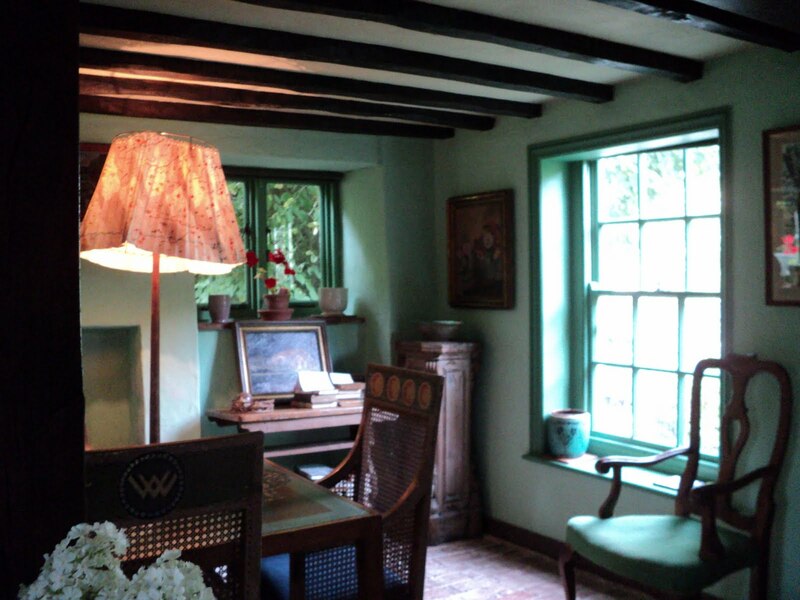 Virginia Woolf's house would be worthy of an interiors blog today. It just goes to show the timeless quality of English style. Your friends had obviously cared enough to plan a day full of little perfections, how lovely. We were in that area recently visiting friends I would love to have visited that church and also the monks house. Maybe another day, Phil and I are always visiting Churches, so much history in them!! I agree with you about Great Dixter there is too much in the garden. We also prefer Sissinghurst in that area. Have a great week, Jackie in Surrey, UK. How lovely of you to write it, for it was a day of 'little perfections' which had been so carefully planned by our friends. Yes, you are right, there is something very timeless about the English style which always, or so it seems to us, achieves its effects without too much in the way of effort. Next time you are with your friends in the area, do be sure to include Berwick Church for we really do believe that you will enjoy it so much. Even the churchyard, which is left wonderfully unkempt, is such a joy. Sissinghurst has always been a great favourite of ours and is a garden which, we feel, teaches so much about design and planting. How decorative for an English Church, it reminds me of the jewel box like churches in Rome. One of my favourite visits to England included Cloud Cottage - T E Lawrence's home, I would love to see Monk's House. Jesus looks rather old in Vanessa Bell's work. Was that room in Monks House a 'room of one's own'? It sounds like a lovely day out. Thank you so much for taking the time and trouble to comment in such detail. It is much appreciated. We too agree with what you say about the Bloomsbury Group, and other similar sets too. One of the great joys of our lives has been to have known, and know, and to count as friends, a great number of artistic and inspirational people, both young and old, whose lives are deeply rooted in the Arts. Yes, we also know the film of 'A Month in the Country' and think, very possibly, that we have it as a DVD. It is another of those rather understated, low budget films which we find particularly appealing. A young Colin Firth, together with a youthful and beautiful Rupert Everett, is also to be seen in 'Another Country' which, if you do not know it, we would thoroughly recommend. We watched it again this weekend with our young Hungarian friends, Viktor and Zoli. But, sorry, this is not intended to give you yet more work!! What a strange combination of different movements, crafts and tastes. A little like Tudorbethan and baroque with wholly modern touches. Fascinating. If the whole works, then why not. We have never visited the church, in fact, I doubt that we have ever heard of it, but now it is definitely on our 'must see' list. Your day out sounds absolutely delightful, just the kind of day we would enjoy. Eccentricity, culture, civilised conversation and charming country inns, there is little else that comes close to heaven. And you had guides who knew the way. What a wonderful tour you have taken us on. The murals are magnificent and the use of clear glass in the windows is inspiring, after all what better picture is there than the surrounding countryside, nature's creation. The house too looks so cosy. What a delightful church and, although there are modern touches, they have only enhanced the beauty of the place. As you know, my sister lives in the area and I know that she has visited Monk's House but I don't think I've heard her mention St Michael and All Angels. We are definitely taking a trip to visit this stunning little church. I personally feel that the murals are perfect and seem to bring this lovely church alive. I'm not normally one to like modern additions to old buildings but, done properly , it works, as it has here. You both always introduce us to the little tucked away places that we don't often hear about and for that, I am most grateful. It is, as you suggest here, very difficult to imagine that English churches, prior to the Reformation, would have been highly decorated. Berwick was an experiment which, as far as we are aware, went no further. We are fairly certain, Tabitha, that you would much enjoy Monk's House, and Charleston too if you have not already been. Well worth a foray to Sussex at some point. That was interesting - I wasn't aware of Duncan Grant's 'doom' painting. When I helped H.I. to reinstate the medieval doom board of Dauntsey, we would think of 'A Month in the Country' alot. Our pictures do not usually come out very well but on this occasion, as opposed to normally, we had more than enough to choose from. Hence this post has somewhat more images than usual! Yes, we too much enjoy looking at churches. Here in Hungary, alas, they are often closed unless one's visit coincides with a service. Now that is a happy thought! Ready made distractions from a lengthy sermon! You would, we are sure, find Berwick Church of huge interest. Not only is the interior so full of glorious things but the churchyard, into which some modern sculpture had been placed, is an absolute delight and the setting is wonderful. There is also a very handsome rectory, mid C19, but that may only be glimpsed. It was indeed a perfect day out and one which friends Peter and Nigel had planned with such thought and care. We were also so fortunate with the weather as it was, unusually, a pleasantly warm summer's day. The naming of the church is wonderful - they probably called it St Michael's first of all, and then, realising that it was not to be any old church but rather an absolute achievement of craftsmanship, decided to add all the angels, no exclusions, no hard feelings among the lesser angels. What a mellow day out, and a joy to be surrounded by calm beauty amid the commercial and technological rush of the modern world. You surely know how to live well, Jane and Lance. Yes, an eclectic mix which so appeals to us too and which is, or so it seems, totally English and seldom repeated elsewhere. But that may appear to be so through a lack of detailed knowledge of other cultures. Whatever, we are certain that you would delight in Berwick and do hope that, at some point, you are able to cross the country and visit. Peter and Nigel were the perfect guides - exceptionally knowledgeable but never overwhelming. We are so pleased that you have enjoyed Berwick as much as we did. The clear glass to the ancient windows works surprisingly well and does allow for the interior to be flooded in natural light. Monk's House is also a dream. So simple yet so desirable. Wow, how many times have we been through Berwick and not known of this beautiful church. We now have it on our list of things to do thanks to your wonderful blog. Again I have never visited Monks House either, and it is so close. Rottingdean though, is a well visited village and the Kipling Gardens are a joy on a nice day. We are so appreciative of your kind comment, Jackie, and the interest which you always take in our posts. Berwick is an absolute gem and we know that you will delight in it as much as we have. Like you, we are always wary of modern touches within old buildings but everything in this church has been carried out in the best possible taste [whatever that is!] and with a keen eye to good design. And, when you do go, do look out for a tiny fernery nestling alongside an ancient tomb at the side of the church. Lovely. The work on this church is an absolute masterpiece, and the wealth of history just adds more value! Both sentimental and visual, I do love old churches, there is something exceptional in them, just knowing that so many people were born and died in its surroundings... wonderful! And the house of Woolf, a superb look into it, thanks! Now, the mediaeval doom board at Dauntsey is something completely unknown to us and needs to be investigated as it sounds most interesting. We assume this is Dauntsey in Wiltshire which we only once ever passed through en route to Longford Castle, many years ago, to which we had been invited to look round. You express it so well for it was a 'mellow' day out. What a perfect description. We love your idea of adding All Angels and wonder if this includes those which are deemed to be 'fallen' as well? Whatever, as you say, no-one needs to feel left out. We are so pleased that you now know of this little treasure which is, as you may imagine, so wonderfully worthwhile visiting. Combine it with Monk's House, and possibly Charleston too for complete saturation, and you have a very full day. Rottingdean is a rather quaint little place resonant, as you say, of Kipling. On that subject, if you have not been to Bateman's then that too is a good day out. Yes, we do so agree with you, it is all rather wonderful and we too love the feeling of people in communities of old who have forged through their work over centuries the present. And, what is so nice at Berwick, there is a sense of leaving something very tangible and good for future generations. Having frequented Greek Orthodox and Roman Catholic churches throughout my childhood, I have always felt that churches should be beautiful. If it doesn't inspire awe and wonder, then it's not doing its job. We do so agree with you that churches do need to inspire, be beautiful and to be uplifting, all of which is certainly satisfied at Berwick which really is a little known gem and well worth a visit should you find yourself, on one of your travels, in Sussex. And how interesting to have been brought up with knowledge of both Roman Catholicism and Greek Orthodox. Eleni, how very, very kind of you to think of us for an award. We really appreciate what you say about our blog and for including us as one of your Versatile Bloggers. Sadly, and we do hope that you will understand, we must decline having decided at the outset of writing our blog in April of this year that we would not, if offered, accept any awards. To take this would, we feel, be very unfair to others who have also nominated us for a variety of things. But thank you so much. What a treasure of church art. Thank you for taking us on this trip. Fortunately I read your readers comments first. I was going to write about Lady Waterford, but my dear friend Julie [The Cloth Shed] has already left a comment about this gifted artist, so I shall not repeat the information to you. Your pictures are wonderful. It is often hard to capture the sheer magnificence of something seen with the naked eye. In 2009, I read with interest that the textile artist Caroline Zoob had moved to Monk's House with her husband. The National Trust needed tenants to look after the property and gardens. I think they felt they could not miss out on a rare opportunity to live in such an important historic house. And what a beautiful property it is too. And for me, another church and house to add to my ever growing list of places to visit. Sometimes in America, when you least expect it, you will come across similar WPA or other frescoes and murals, although not often by such distinguished artists as at Berwick. How nice that this church is being sensitively restored and maintained. I am too used to old buildings being mutilated in the cheapest way possible for "budgetary reasons". 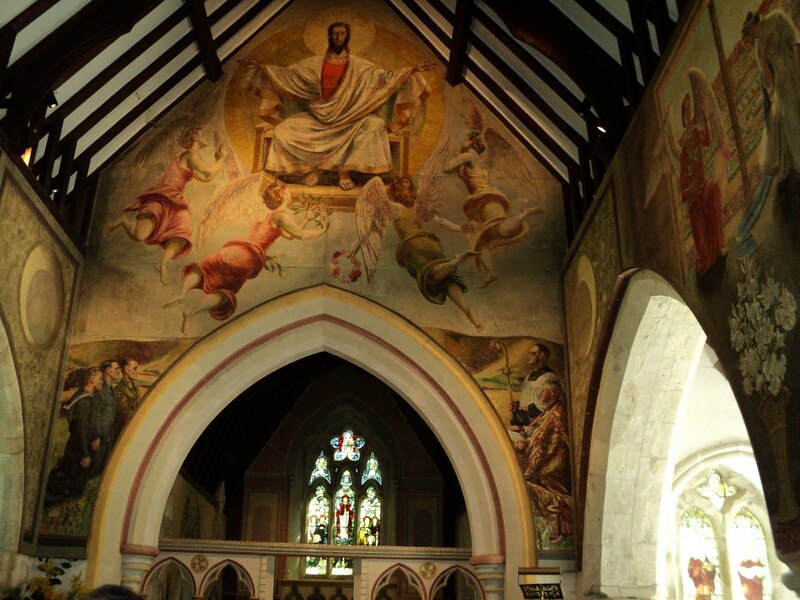 We are very fond of the work of Duncan Grant, so this church is a little treasure for us. We are pleased that you liked it too. Well, that is most interesting about Caroline Zoob. We knew that the house was tenanted but had no idea who it was. Certainly, they have their work cut out with the kitchen garden as it is very extensive indeed! We had only come across Caroline Zoob recently on another blog, Abby, and are most intrigued by her surname. There is a famous and talented fashion designer in Budapest called Kati Zoob and we wondered if they were related. We shall try to find out!! How wonderful to have such thoughtful friends to treat you to such a well thought out day. I hope you don't mind me saying that I'd feel more comfortable in house of Virginia Wolfe rather than the House of the Lord. I visited many of the tiniest of churches, in the smallest of villages in Switzerland this year and felt quite uneasy at the overwhelming opulence in the smallest of spaces. A personal, if hopefully not offensive, point of view. I too was aware that Caroline Zoob (an ex lawyer I believe who had given up law to follow her dream of making a business from making beautiful things by hand) had taken up residence in the home of Virginia Woolf see: http://www.telegraph.co.uk/culture/3666384/Bloomsbury-setting.html. Some years ago I purchased some of her rustic pottery pieces, which I still love, though her style has changed since then. It is so very sad, as you say, that so many treasures of buildings the world over are simply falling down due to neglect or lack of funds. In Budapest, decades of lack of investment have led to vast tracts of the city with holey roofs and peeling stucco although strenuous efforts are being made to catch up. We can well understand your feeling more in tune with Virginia Woolf's house than with Berwick Church. It is such a very unassuming house with a great sense of homeliness and well-being that one cannot help but be endeared to it. However, it was a grim existence when VW first went there with no electricity and only the most basic of plumbing!! Thank you so much for providing the link about the tenancy of Monk's House, we shall certainly be following it up. Hoping, dear Isobel, that you are feeling better and more yourself. Back pain is so very trying. I'm amazed at what you fitted in to one day (oh! to be whisked off in a red sports car...). One can only imagine how much support that church offered during the war. The walls depict such a fitting contrast, the sanctuary of heaven vs the toil, ever changing landscape, and battle on earth - which are timeless images. I feel the addition of the clear panes of glass and a beautifully crafted door have added to, and enhanced the classic elegance of the building. And Monk's House - I'd love to have been a fly on the wall! Thanks for sharing your fascinating day out, I wish history had been this interesting at school. Thank you very much for your good wishes - the pain continues. Medication helps but not entirely. However, for every cloud....! During these miserable days, instead of being alone in a room all day long, my computer has become my bed fellow and with it I can travel the world and talk with friends all day long. A wonderful thing! I hope you got my previous note about your cards - delighted they are being well received. I am precluded from making anything in the meantime but hope to be back on form soon - after all Christmas invitations to attend events are beiginning to arrive! Hard to believe I am mentioning the 'C' word already! Yes, it certainly was a fun packed day! How perfectly you describe here the contrasting and complementary elements in the church's decoration and design. All these things worked, for us, wonderfully well and we found it a most inspirational place. Monk's House is a treasure and, if you have not visited, we can recommend it wholeheartedly. Oh dear, Isobel, we are so very sad to read this. We are full of admiration for your stoical attitude, but in our experience pain such as what you are having is so very debilitating and incredibly tiring. It is extremely difficult to get up any enthusiasm for anything very much and, as you say,medication does not ever quite answer the problem entirely. Still, it s good that you have the companionship of your computer through which you can transport yourself across the world and back in a day and we can have the pleasure of your company too!! Yes, thank you, we did get your message about the cards and hope that you have cashed the cheque!!! Christmas must indeed be a very busy time for you although, [and this is just between us], we have given up sending Christmas cards almost entirely. When it became an Arms Race we made the decision to call a halt!!! Take the greatest of care, Isobel and our thoughts and good wishes are with you!! My dear Jane and Lance, Thank you so much for this delicious post. I've never been to both of these places you mentioned here. I would love to visit there one day. When I was down in Brighton many years ago, I had a plan to visit Charleston House but it rained so heavily that my friend decided to stay in with an old back and white movie. The religious paintings inside the church of St. Michael and All Angels are absolutely stunning. They reminded me of Piero Della Francesca's paintings. Of course both Vanessa and Duncan were great admirers PDF's paintings. "Spring" and "Summer" painted by Duncan are quited interesting to see. I wonder when they were painted. Duncan was working hard as an agricultural labourer on the farm during the war. His health wasn't great at the time [mental and physical exhaustion as he wasn't used to hard work on the farm and also the lack of meat in the diet]. Vanessa tried to ask the authority to dismiss him from the farm and she tried to employ him as a gardener at Charleston to ease his pain but they rejected her proposal. But these Seasons images seem to reflect his initmate knowledge and experience of working on the farm. I love your Monk House's pictures. I especially love VW's bathroom which I'm sure you might have seen. It has a free standing bath tub which was painted. It looks like you and your friends had a great day out. Many thanks for sharing it with us. I've read J.L. Carr's novel, 'A Month in the Country' a long time ago. It's such a gentle story. Carr and R. F. Delderfield (who was a Socialist) are such underrated writers...I don't know if people still do read their novels. you hooked me straight away with your mention of 'A Month in the Country' - my favourite novel. And the murals! How wonderful that they were commissioned, that the church's purpose has been given new life for a new age, with work in harmony with its context, so light and fluid and joyful. A wonderful, subtle and lovingly put-together revelation. We had not considered before your mention of it that, in all probability, the 'Seasons' were based upon Duncan Grant's direct experience of farm work which, as you point out, must have been endlessly tiring to someone not altogether used to manual labour. Thank you so much for that insight. You are, as we should have known, so very correctly informed about the influence on DG and VB of the work of Piero della Francesca, particularly the frescoes at Arezzo, as well as mosaics at Ravenna, in their 'Italianisation' of Berwick church. Yes, Carr's novel is, exactly as you write, a 'gentle story'. We should like it to be otherwise, but Delderfield is possibly no longer read, at least not by the youth of today. Charleston is glorious, simply glorious. We say with certainty, you would love it. We are delighted that you too know of and have enjoyed Carr's novel. We have, dear Faisal, so many shared interests that it is such a pity at moments like this that we are separated by half a world. You write of the church in such a sensitive and meaningful way; your comment is a joy to read. Thank you so much. It seems to have been just the perfect day... thank you for showing us all these wonderful things! What a wonderful post, I wish I could have tagged along. My daughter is taking a class on Virginia Woolf this semester, nut this first hand tour is probably worth an entire semester's worth in a classroom. Beautiful church! It was indeed the most wonderful day and all entirely arranged by our friends who do, always, have an eye for the finest detail. We are so pleased that you enjoyed the post and thank you so much for saying. How really exciting that your daughter, who we trust has now settled in, will be studying Virginia Woolf this term. Not the easiest of writers but one who, we feel, is endlessly fascinating and who repays constant rereading. I can't tell you how perfect your timing is. I am always looking for extra examples of work by Duncan Grant and Vanessa Bell that I can show the students. Their art objects seem to have been lost in the mists of time. But here is something I have never heard of: the Bishop of Chichester commissioning members of the Bloomsbury Sett as a catalyst for promoting a new relationship between the Arts and the Church. The Bloomsburies' behaviour was not exactly... how can I say this nicely..... clerically approved? We are delighted that this has proved to be a timely post for you. Yes, it is rather extraordinary that the then Bishop of Chichester, by the name of Bell, should have considered the Bloomsbury Set to carry out this work. It did, in fact, come about because he, Bell, was a friend of Sir Charles Reilly, a neighbour of Duncan Grant's aunt, who knew of the artist's work. The church also contains work by Quentin Bell sited within the Chancel where, in 'The Supper at Emmaus', Leonard Woolf is said to be the model for Jesus. Quentin Bell's work here is much heavier in style, and rather Victorian in appearance. What a perfect day! I am afraid I would have been on sensory overload. To end the day with Virginia Woolf and Kipling would have been the ice cream on my cake. Thank you for sharing such a wonderful post. I so often live vicariously. What a splendid day you had — I wish I could have come along for the view and history lessons. I'm impressed by the bishop's choice in artists, and by how well the paintings of Duncan Grant and Vanessa Bell work together — beautiful! Yes, it was a perfect day and wonderful weather too. It was just as if we were living the 'Bloomsbury' life as one can so easily get swept up with it all in those surroundings. We were also lucky that we avoided the crowds!!! I can smell the interior of Monk's house, just allowing my eyes to linger over the images. Have you ever read, 'To Say Nothing of the Dog?' by Connie Willis. Much of what you've written here brings that book to mind. She is in a cathedral that was bombed during the war, St. Bride's, and as it turns out, the bombing lays bare riches which would otherwise have been left undiscovered. The comparison between the fact that she doesn't marry the unworthy bloke and the ravaging of the cathedral unearthing treasure entombed within isn't hammered home. It's beautifully-executed. I loved the book. Yes, the paintings of Vanessa Bell and Duncan Grant do complement each other beautifully. Of course,as we are sure you know, they were lovers for many years and so, perhaps, that influenced their creative works to a large extent? What fun if you could have been there too. We are sure that you would have enjoyed the visit and would, most certainly, enjoy Charleston just up the road!!! What a simply wonderful day out you've had, fascinating and so close to home, thank you for sharing. The photographs have really caught the spirit of the place so wonderfully rich and detailed but then to top it off with inns and Virginia Woolf how delightful. To have such history on our doorsteps is a privilege and to read about it here a pleasure. It sounds like a wonderful outing. The church with its murals is very interesting, but when I came to VW's home, I paused on the stairs to look at the butterflies under glass and wondered briefly how she came to fill her pockets with rocks and bring it all to an end. I don't man to be a downer, but the china on the mantel seems sad. It's as though I can hear a clock ticking away the hours still. A day of visits to intriguing places with good companions sounds just about perfect. Your ghostlike companions at tea make it even more so. Fine company. We just know that you would love Monk's House. Its beautiful simplicity, the feeling that Virginia Woolf has just stepped out of the room, the atmosphere of a highly creative place full of intelligent conversation and witty banter. Perfect! We do not know of either of the books that you so kindly provide links for here and can well see how this post reminds you of the Isabel Wolff novel. Yet more for the reading list, but, rest assured, that we value your recommendations highly and will surely seek them out!!! Thank you so much for your very kind and generous comment. It is true that there is so much to see within a small radius of Brighton. Such wonderful countryside and some fascinating places to visit. We are indeed lucky to have all this within easy reach and, when enjoyed in the most engaging of company, it is all perfect! There is, as you suggest, something rather wistful if not melancholic about Monk's House. Knowing that VW drowned herself does make one wonder how such a highly creative soul, living in such a peaceful place, could have become so tormented that she wished to live no more. However, for us, her spirit lingered on at Monk's House where we felt that at any moment she would walk into the room and arrange for afternoon tea to be served. We had a most wonderful day, Diane and enjoyed ourselves enormously. The trip had been planned for a while and so we were very excited when the day finally came. Yes, the clear glass is so beautiful and enables the church to 'borrow the landscape' beyond. It was a superb day and one which, we are certain from all that you write about and do, that you would have enjoyed immensely. Sussex is indeed one of the loveliest of counties within reach of London and full of the most wonderful treasures such as the church at Berwick. We are so fortunate to be transported to these delights by our friends in their jolly red motor car - which we think you would see as great fun! So it must have been Bishop Bell, that wonderfully honest man, opponent of carpet bombing, firm in his belief that the church did not exist to bolster the state in nomatter what who commissioned the work. You are absolutely correct. It was indeed Bell but apart from that we know very little about him. Your comment, for which many thanks, has prompted us to find out more. What a nice way to spend a day, I wish I was there with you. Good company, great art, good food and beautiful environment, what else one needs, can it get any better than this? A memorable day out Which you both seem to have enjoyed very much. 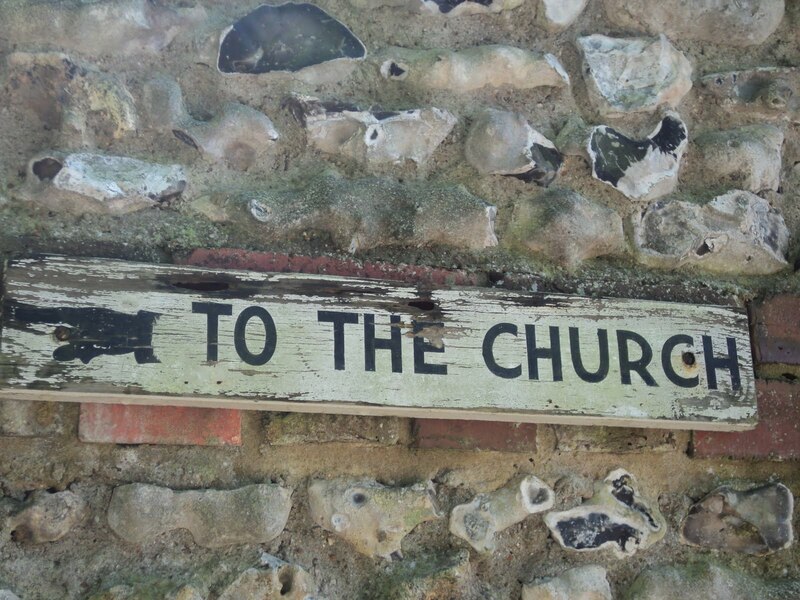 The church was well worth a visit and you have shared the best bits with us through your photographs. What a treat to have both lunch and tea out! Oh my soul. I've never even heard of this. I must go next time I'm over. Just sublime. And dear, dear Virginia.... my hero. Hello Jane and Lance! I have been transported! To take this little trip with you to Berwick from my little studio in the Pacific Northwest has been a marvel. I am entranced by the murals of St Michael--it reminds me a bit of the work that was done under the auspices of Franklin Roosevelt's Public Works Projects here in the US--some of the best public American art was produced during this time. I am particularly fond of the image of the three soldiers. It locks the mural in time and memory. There looks to be a dreamy quality to the light and the interior--soothing and so quietly beautiful. I also love the stop at Monk's house. And my very favorite part of the whole post is you last sentence. As I said…you have transported me. Thank you. I would love to see the Church someday, the murals are beautiful! Day trips like that are my kind of thing. I must add the book to my reading list, too! You are absolutely right...it does not get better than this. We loved every minute! We are so pleased that you enjoyed looking at the photographs. Our photographic skills are very poor indeed and so we were delighted at the end of the day that we could actually make out what we saw!! No flash allowed at Monk's House.....but that seemed to improve things!!! Such a treasure trove of Bloomsbury riches in Sussex for you to explore, Pamela. Charleston, Monk's House and Berwick Church all within the same county. A definite must for your next visit we think!! We are delighted to think of you joining us on our day out in spirit if not in body!! We are sure that you would love all of this, as we do. It is the simple domesticity of it all which has such an appeal for us and the thought of such a melting pot of creative and intellectual life. You are so generous with your praise, Elizabeth, for which we give our heartfelt thanks. We often think that day trips are the best. Not so much planning required, not so much work needed for any single individual, lower expectations and yet a jolly good time is generally enjoyed by all. Perfect!!! We are so pleased that you like the church and its murals because it now has a place amongst our favourite English churches. We love the work of Duncan Grant and it complements the architecture beautifully in our view. What a(nother) wonderful post - I do so enjoy reading them. And I have found old friends here - I love the work of Virginia Wolf and her sister. The church and the art there is stunning but I think the thing that struck me most about this post was the clear glass in the church windows. Totally illuminating!! Loved it - not all churches could carry it off, but this one definitely does. What a wonderful treat, for you and for us, as you kindly share the wonder and beauty. Whilst I many not believe in god in any guise or term, I still find the houses of her followers incredibly beautiful, precious in their historic grandeur, Berwick is a classic example of both. Oh monks house, what a treasure of time standing still. I loved the butterflies upon the wall, can't think why! Thank you for this breathe of fresh air. VW and her sister were certainly extremely talented, indeed the whole family was very bright academically and highly creative. We totally agree about the clear windows. Such a surprise but incredibly effective and did flood the whole church with light. It is, of course so wonderful to have all of this so close to Brighton in order that it can all be enjoyed in a day. Monk's house is a delight and although quite small is full of interest with a wonderfully peaceful atmosphere. We are pleased that you liked the butterflies. There are so many wonderful small touches throughout the house which appealed to us, all of which we should have loved to have taken home!! This sounds like a delightful day. I did read 'A month in the country' a long time ago. I think it must have been somewhere in the 1980s. I can remember seeing a beautiful film made of the novel with a handsome fair haired man in one of the leading roles. I think it must have been Kenneth Branagh. The church looks beautiful. So does Monks house. We planned to see the house two years ago, but unfortunately it didn't come to it. Perhaps next year. 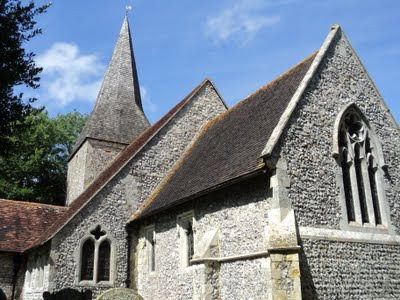 I must admit to my American view of English Village Churches, through rose colored glasses of course, that I would love to live in a village that had a small church that I was able to go to. If it looked anywhere a wonderful as this one so much better. It's incredible the way the presence of prominent people remains in buildings. I thought that I'm the only sensitive one, but I'm glad I found some like-minded individuals. Yes, the film of 'A Month in the Country' did star Kenneth Branagh and Colin Firth. We are sure that you would like to see Monk's House. Such an unassuming house set in a quintessential English village and with a pretty flower garden and enormous vegetable garden. We can recommend it for your next visit. Wishing you a lovely week too!! We can totally understand what you mean about worshipping in a church such as this one in Berwick. We too would be very happy to go along each Sunday and soak in the peaceful atmosphere and gaze on the beautiful murals. Perfect! For us, the presences of Virginia and Leonard Woolf were very strong at Monk's House. The simple domesticity of their lives and the ever present literary influences and elements were in every room of the house. We found it enchanting. I love this post. This is definitely going on my to do list. The church of St. Michael and All Angels is simply lovely. I have done Charleston House, but having just watched the film The Hours, I am in the mood for Monk House. We are so pleased that you found the post of interest. Just like you, Barbara, we are very fond of seeking out lesser known places in the countryside and sharing our discoveries with others. Yes, 'The Hours' would, in our view, be the perfect preparation for a visit to Monk's House. Quite different from Charleston, which has to be our favourite, but nevertheless intriguing and incredibly atmospheric. Do go!! Thank you very much for this post! The murals are so beautiful. I am always fascinated with the homes of writers and artists - one wonders where they preferred to sit, and how their surroundings might have inspired them. I would be very interested to see Monk's House the next time I visit England. I hope you are having a lovely start to the week! It is indeed fascinating to try to imagine where creative people have found their inspiration. 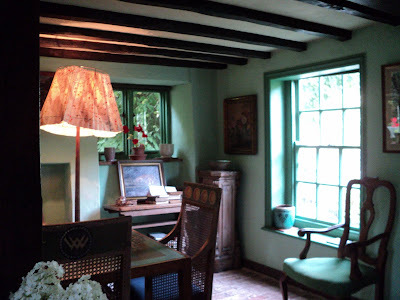 At Monk's House, VW's studio, where she did her writing, is a very spartan place, set in an outbuilding in the garden. It was most intriguing to think of her at that very desk all those years earlier penning her novels. You are so right. And, in the case of the church at Berwick, it is so good to know that contemporary craftspeople are still making their contributions and their mark.It makes it a living place rather than a museum. What a beautiful post Jane and Lance. It looks like you've had a pretty special day with friends enjoying amazing sites. I am particularily interested in the home of the great Virginia Woolf. As always, interesting and inspiring post. Thank you for such a kind and generous comment. If you have never been, then a visit to Monk's House we should unhesitatingly recommend. Simply furnished, set in glorious downland countryside and the air redolent with the ghost of VW. Perfect!! What a glorious day you had. I can almost picture the four of you motoring along the red car, and could feel the peace and beauty of the church through your pictures and words. I knew Vanessa Bell was an artist, but not that she painted in a church, which adds an interesting dimension to the Bloomsbury Set. And then to see Monk's House! I am intrigued by Rottingdean--which I am not familiar with--a seaside village with strong literary associations...I want to know more. You certainly cut a dash motoring through the English countryside in such style. What a perfect day you had. The church is magnificent and to see the paintings up close must have been very special. Monk's house holds many beautiful treasures. I have made notes and will one day, hopefully, visit. Thank you and so delighted to read of your memorable day with friends. This small church is amazing with its paintings and clear windows. I could easily see myself sitting inside for quite some time pretending to be meditating, but looking at the work on the walls. But then, I suppose that is meditating. What a gem of a church ... and such beautiful murals. I have no idea why as they're totally different but they put me in mind of the M.E. Eldridge Gobowen mural ... something in the way they are happened upon perhaps. Except that the Gobowen mural is no more. What a day you experienced! The church is lovely in every way. The architecture both inside and out is stunning and of course the paintings are gorgeous. I never tire of seeing old churches and studying the meaning or story of the murals. I love the colors he chose. Then to see Virginia Woolf's home on the same day. 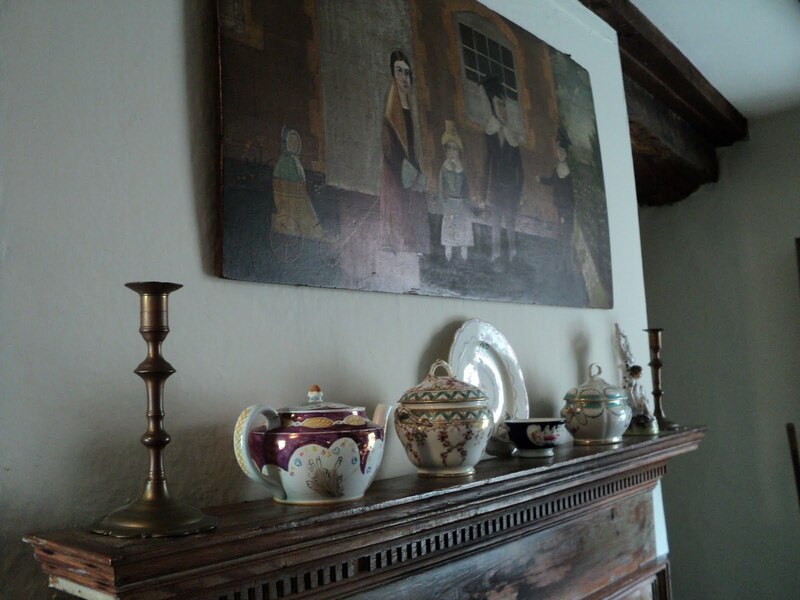 Your photos show so us so many details...I enjoyed seeing the arrangement on the fireplace. What a day! Absolutely beautiful. The Monk's House seems like a very interesting stop along the way as well. What an incredible day of thought-provoking discoveries. The element I am most taken with, is that there were servicemen painted on the mural in the church. Having not lived through that time, it is stark reminder of how all-encompassing the war was, and how personal were the losses. What a lovely day for you, thoughtful friends, and a treat and education for me. Oh dear...I don't know which I am the most envious of, your visit to the church with it's amazing murals or the visit to Monk's House. I have been fascinated by the Bloomsbury Group for a very long time. I had no idea that they did any religious images. Absolutely wonderful, thank you for sharing this with us. I definately learned something new. As it happens it was one of those perfect summer days which do not, alas, happen all too often in England. The church is wonderful and well worth visiting. And whilst we have see Vanessa Bell's work previously as paintings, of course, and on furniture, we had never seen any murals by her so much of it was completely new to us. Monk's House is charming - totally simple and quite unspoilt. We are sure that you would love it. Rottingdean is a small coastal village lying just a few miles from Brighton. It has many old houses and has always attracted artists and writers. Jen, we really do appreciate your making the time to comment on this post in the midst of all your on going difficulties. It is so kind of you. And the day would have been even more memorable had you and your husband been able to join us. As it was, we had a lovely time with so much of interest to see. And, yes, the murals are wonderful. Certainly there is something very special about Berwick Church, not least, of course, the murals. But the whole situation is lovely with the churchyard overlooking the Sussex Downs which now form part of a National Park. And Monk's House was exactly as if Virginia Woolf had just left the room and would return in a minute or so with a tray of tea! To our shame we had not heard of the work of Muriel Eldridge until now but, having looked her up, we should agree that there are notable similarities. One mural, previously commissioned for a hospital dining room, is now to be displayed in the 'Creative Industry Building' at Glndwr University. Could this be the one to which you refer? It most certainly was, as you clearly are able to imagine, the most wonderful of days with Peter and Nigel gently guiding us from one delight to another. So much to see and take in and everything of huge interest. Exactly our kind of a day out! It was all wonderful. Monk's House is absolutely fascinating with the rooms open to the public exactly as they might have been during the time in which Virginia Woolf and her husband, Leonard, lived there. We too found the inclusion of the servicemen, and the poppies, remarkable - a touching reminder of the presence of war even in that very rural, almost isolated setting. The models for each of the men were, apparently, known to Duncan Grant, the soldier, Douglas Hemming, later to be killed on active service in 1944. Thank you for such a very kind and generous comment. It is much appreciated. It was, indeed, the most delightful of days and one which will remain in our memories for a long time to come. We shall very much hope to welcome you here again. The whole day was, as you may well imagine, a magical experience for us particularly as, like you, we are greatly interested in, and enjoy the work of, the Bloomsbury Group. Perhaps on your next visit to Europe you may be able to take in Sussex?! It is so true that we can so often overlook what is right under our nose. Sussex is full of wonderful things that we have yet to discover and we try to see something new each time we return to the UK. I guess I have to add this to my must see list next year. What a gorgeous combination of old and new. It is a gem of a church, isn't it? I must say, on seeing the house, I could write there very easily.... I had forgotten how lovely it is. Great to have friends that will whisk you away to treasures like that!!! Churches, Murals and the Bloomsbury Group, some of my favourite things! After reading about your day and seeing the photographs, I now have another place to visit as a treat to myself. I also love ' A Month in the Country' , which I re- read earlier this summer. Looks like you enjoyed the day from the beginning to the end. I like seeing different architecture style and if I can step inside, it’s more lovely. The best thing next to going there in person would be to see fabulous photos of the places with informative narratives – thanks for that. The church would be the result of excellent craftsmanship back then. I wonder if the church is Norman style seeing from the first image, but then again no seeing from the third one. I’m interested in the materials of the wall – maybe limestone? Murals are gorgeous with still vibrant colors, arch windows are nice and elegant, and I like the new door made of oak and ironwork for their simplicity. Woolf’s room looks cozy. Thank you for sharing, Jane and Lance. Have happy days ahead. Oh dear. You have me pining for East Sussex, and that really won't do! I used to live in the Burwash area. I do believe it is now official, dears J and L -- you two lead the charmed lives of a pair of sweet little globetrotting garden gnomes. I can only imagine the magical presence you must've felt not only in the church but also at Virginia Woolf's. Unbelievably lovely, all of it. Yes, we agree, somehow a literary air hangs over Monk's House and one can easily feel moved to read and write in that peaceful oasis. We do feel very lucky to have such good friends as Peter and Nigel who not only take us to these hidden gems but are so very knowledgeable about them too. And, enormous fun!!! Yes, do treat yourself to a visit as we are sure that you would love it. Monk's House is open until October we think but only on two days per week. Still, time enough yet!! We are so pleased that you enjoyed 'A Month in the Country' too. The church dates from Saxon times and the murals are painted on plasterboard panels which have then been attached to the walls. Monk's House is a very unassuming place where one can easily imagine literary gatherings around the fire and lively discussion well into the night. The house was in a very poor state when bought by the Woolfs and we understand that the novel 'Mrs Dalloway' paid for the installation of a lavatory!! Ah, but we have yet to discover Egypt, the secrets of the Nile and the magic of mummies......but, given time and with your assistance, dear Alcira, we shall no doubt get there!!! We are sure that you too would love Monk's House, absolutely wonderful with a bohemian charm which does not fail to beguile. I enjoyed joining you on your tour of this lovely little church. The paintings are wonderful and I enjoyed the house interior very much. Things tend not to be very old where I live, except for the land. The land is very old. :) There are lots of fossils and marks of the Earth's ancient past. What a beautiful tour you gave us all! Your photography was superb, as were your descriptions. It was nice to come along with you on your day out with friends. Thank you for the wonderful tour of Berwick Church and Monk's House. The paintings are simply amazing and with such expert guides, it must have been a thoroughly enjoyable day out. What an absolutely delightful post, Jane and Lance. I am delirious with envy - but in a good way. I'm so happy you chose to share your magical day with us. In a way it brings back to mind my own long ago trip to England and the awe and inspiration I felt at the time. We are so pleased that you enjoyed reading about this most intriguing corner of England. We are indeed fortunate to have so many ancient buildings to visit and all within a relatively short distance from our Brighton 'rooms'. Although we do take many photographs, more often than not they are hopeless. As luck would have it,on this particular day we could do no wrong with the camera and so we were spoilt for choice by way of illustration for this post!! We are delighted that you enjoyed the 'tour'. It does, as you say,make all the difference to looking at things when one is in the company of knowledgeable guides. Peter and Nigel are the perfect tour companions in that they are well read in their subject but are never overwhelming with their approach. A brilliant day out!! We were most interested to read that you had visited England once upon a time. The Sussex downs and the many pretty villages are so quintessentially English in our view. We love exploring its many secrets!! Well I've learned something new, and extremely enlightening about the Bloomsbury group here...I had no idea that Vanessa and Duncan had painted so beautifully in this or any other church...it fascinates me. What an amazing group they were...how fortunate that your dear friends took you to see both the church and Monk's House. The inspiring atmosphere of both places must have left you filled with an even grander sense of the creative spirit...your sublime quote about Kipling, Conrad, and DH's ghosts 'forever mingling with the cry of the gulls' attests to that...it's just lovely. What a charming post about a delightful day. One of my favourite pastimes is visiting old churches when abroad or in my own city, so I certainly share your joy and enthusiasm. The only thing more wonderful that visiting such a church, would be visiting when there is choir and/ or organ music. It saddens me greatly that churches in North America and England are being closed, sold, converted, or demolished because of neglect, apathy, and diminishing attendance. What a great loss. I pray that there will be renewed interest and reforms in Christianity that will bring people to return, and these architectural marvels of faith and art will continue to exist into the future. The clear glass windows give a fresh bright look, but I hope that none of the pigments in the frescos will be in any way compromised by the less filtered UV. I very much enjoyed this article. The pictures of the church are breathtaking and the tea sounds perfect. Just not the same as a trip to Walmart and a happy meal at McDonalds! What a delightful post; the only thing that would have made it perfect would be a photo of that delightful car -smile-. The next time I visit England, I want to travel further than London and Oxford. Amazing to see the paintings preserved so well; I can imagine attending a service in that church and being distracted by all the art. Wow! That church is like Dr Who's TARDIS - so much bigger and more expansive (ideologically, anyway) on the inside!! A self-contained historical art gallery of the region - amazing!! Thank you Jessica for such a very kind comment which we really do appreciate. Although we had heard of Berwick Church we had absolutely no idea of the scale of the work by Duncan Grant, Vanessa Bell [and Quentin Bell] to be found there. It was, and is, truly amazing and so very different from their other paintings. And then Monk's House which we thought delightfully charming although, on reflection, we have decided that we prefer Charleston. The cream tea in Rottingdean could be a post in itself for it proved to be delicious but very strange! Thank you so much for this comment and for the one which you have been kind enough to leave on 'An Aesthete in Albermale Street' and to which we have replied on that post. Visiting churches, the graveyards surrounding them, and houses of architectural interest is also one of our principal pleasures and so, as you may imagine, we were particularly delighted to have discovered the church at Berwick. Like you, we mourn the loss of historic churches put to new uses when, for whatever reason, it is no longer considered feasible to keep them open. We too pray for a return to the values of Christianity which, in so many instances, appear to have disappeared in this very secular age. We are fairly certain that those responsible for the murals at Berwick are aware of the effect of light on such works. It is certainly to be hoped. But could anything really beat a happy meal at McDonald's?!! A treat we have yet to experience! And who wants old churches when there is a Walmart?! We are certain that you would have found the car to be very jolly too. And such fun for us to be driven through the Sussex countryside. On your next trip to Britain, we very much hope that you will allow us to take you to places of interest which are, perhaps, less well known. When can we expect you?!! Yes, we too think that the paintings would prove to be a distraction, particularly during a rather lengthy and tedious sermon! Thank you so much for signing up as a Follower. We are delighted to welcome you. Yes, you are right, it does become in its own way a gallery devoted to the work of some of the Bloomsbury Group. But what is rather nice is that it is also the centre of a community and still functions as a place of worship. Like you, we also much enjoy visiting cathedrals, churches, chapels and all religious places for the quiet peace with which they are filled. Sadly, we have little experience of convents, or monasteries come to that! Monk's House was a unique experience, completely atmospheric as you may imagine. And all quite simple but totally charming. holy mother of...wow, what a church. this is what i love about blogging. what are the chances of me ever seeing that church in real life? thank you so much for sharing. You are absolutely right, Janet, that the great joy of blogging is that one is able to have so many very different and very varied experiences from home. Wonderful. And, yes, Berwick Church is something quite extraordinary. Hello Jane and Lance! I'm very pleased to meet you both. Thank you so much for your lovely comments. I am so envious of you being able to visit these wondrous places! How I wish I could linger as you did in Monk's House where Virginia and all the other's I admire once lived. It does look like a delightful home, and I couldn't help visualizing Virginia herself going up the carpeted stairs and glancing through the window as she climbed, Perhaps the Bell children were laughing in the garden and Vanessa was sitting reading under the shade of the trees there. Speaking of Vanessa, what wonderful paintings she did inside the church. Thank you SO much for posting these lovely photographs of your visit it has been lovely to travel beside you! I shall add myself to your followers forthwith! We are thrilled that you are a Follower and thank you so much for your kind and generous comment. We love your blog and are very much looking forward to continuing our dialogue through future posts. Monk's House does indeed have the spirit of VW and those of all the Bloomsbury Set lingering in its rooms and in the extensive garden. We found it to be a magical place and, coupled with Berwick Church, made for the perfect day out!! 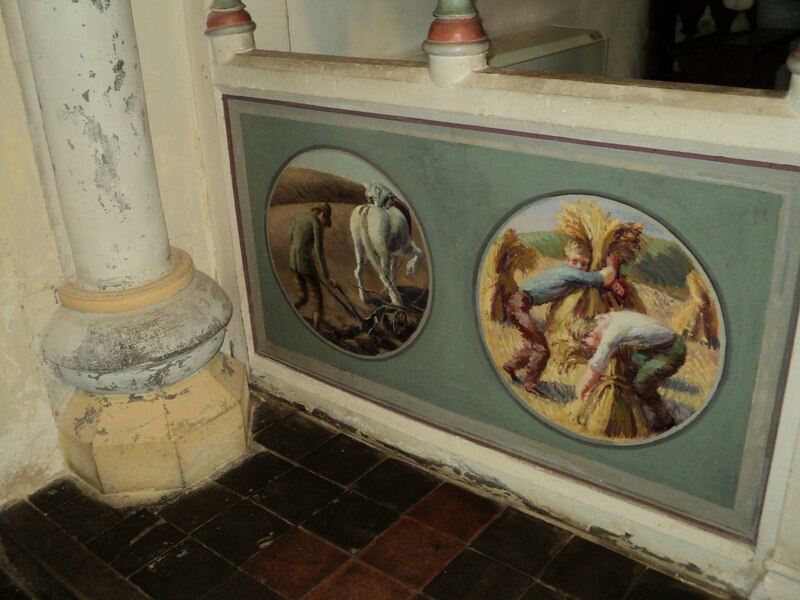 What we liked about the murals was the inclusion of so many elements of simple domesticity which prevented them from being oppressive or too ornate in this most unassuming of country churches. This area of England does indeed have a rich literary history and it is such fun 'reliving' it all whilst seeking out these hidden places of delight. How fortunate to be whisked away on a magical mystery tour in the company of such interesting companions. I have never heard of this church, or its murals and I will, sadly, probably never get the opportunity to visit it. So, thank you for sharing your day. Your page has tweaked my curiosity and, probably like many of your readers, I have been googling the Bloomsbury Group and revisiting some of my favourite modernist authors. Gorgeous church.I felt like I was right there with you.Something about a church feels me with such wonderment and love.Im Greek Orthodox so my little church has a warm and lovely feeling as well. Have the best of days ahead in this week! I have indeed heard of, and also seen the clothes from fashion designer Kati Zoob. I had a look on the internet but could not find a connection between her and Caroline Zoob. It is a most unusual surname so feel that there may well be a connection somewhere down the line. Thank you for your comments on my post. I felt it was best to reply to you on my own post as I have copied/written a rather long answer to your questions. You may need to bring wine along for your visit! What a wonderful way to travel vicariously through you!! This is all so interesting, what a beautiful church. I love the light of the clear windows, and the interior art, wow! A fascinating day out...Monk's House would have been the cherry on top for me. Oh, someday I would so love to travel to this area. So glad for the lovely day you had, and for sharing it with us. We are delighted to think that the post has rekindled a flame for the Bloomsbury Set with you. We always find that when we make such visits our own interest is renewed in the people linked with them and we too are intrigued to learn more. We feel very fortunate in Brighton to have so many interesting places within easy reach of home and have a long list still waiting to be seen!! It is so good, we feel, when one finds a church that one can be comfortable in whether for worship or quiet reflection. Your Greek Orthodox church sounds charming and perhaps we may see it on a post of yours one day? Curious is it not about the Zoobs?!! Perhaps all shall be revealed one day? Thank you so much for your wonderfully detailed reply to our comment on your post which we have much enjoyed reading and have learned so much. We are now in Budapest where the weather remains summery with warm, sunny days. We hear from friends about the poor weather in Brighton so are pleased to have escaped!! We are so pleased to read that you enjoy travelling along with us. That makes us happy! The clear windows in the church are indeed a joy as they bring the countryside inside and flood the whole place with light. Yes, Monk's House was the 'cherry on the cake'. We had been wanting to go fora long time and were thrilled when our friends proposed the trip. Did you also get a chance to visit Vanessa Bell's house, Charlestown House? If not, you must surely. I love these three place, Berwick Church, Charlestwon House and Monk House. We have visited Charleston House previously and liked it enormously. There are ambitious plans afoot there at present to create a much improved visitor centre and we look forward to visiting again when this is complete. Monk's House was a delight and, really, we can never get enough of the Bloomsbury Set!! Thank Y'all BOTH so much for joining LAWN TEA today!!! You're so very welcome, any time. The five other comments were all by Ladies-from-the-South, all of whom knew exactly what I was saying, I imagine, and I'm so glad you enjoyed the little word-play. I've used each and every one of those, myself, I'd think (except maybe the wet dog one---certainly not THAT, not in either circumstance). And there are several more of the same title scattered back through the blog, as I thought of words and phrases to "define" for those who might not recognize some of my Southern speech. I'm sorrounded by carriers and valises and bags with percolator, cups, etc., as well as several bags of clothes-each-marked-for-event, for we're heading to Atlanta tomorrow for a family wedding. I'm looking SO forward to reading more and more of your fun blog when we return---the photos are stunning, as well. But now, since we're hotelling with four Grands, all under ten, We're Off to BE the Wizard! Ah, what a marvelous trip you take us on with your wonderful photographs and lovely text. How lucky for us all that the Bishop of Chichester at that time was so wise--and what fun the members of the Bloomsbury bunch must have had painting their bits of wall! 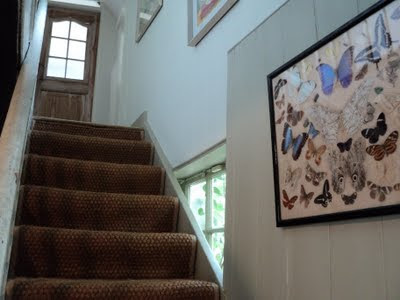 But best of all, for me, was to get a glimpse of Monks House--including the montage of butterflies on the stairwell wall. A fascinating, beautifully-illustrated post about a perfectly splendid day, Jane and Lance. What a gem the church is! I love the clear glass - such light by which to see the paintings. And Monk's House looks so atmospheric and "right". Hello Jane & Lance again. They’re queuing all round the block to get into your blog here, so I sneaked off round the back and crawled under your hedge. Hope you don’t mind. My my, you guys certainly do get around and feast yourselves on so much of the rich under belly tappestry of our art and literature history culture. Whenever do you find the time to catch up on episodes of TV’s ‘Big Brother’ and ‘East Enders’ while you’re over here? You never been tempted to just vegetate in front of a freshly painted wall for a day? I have to admit that I had only heard of ‘The Bloomsbury Group’, although I had no understanding of who or what they were, so thank you for nudging me off to Google and a skim read micro education in their formation and wider function. I had no idea Virginia Woolf was part of the set, or that she so tragically drowned herself in 1941, the same year that Duncan Grant was commissioned to paint his murals on the walls of that beautiful old quintessentially English country church there. How about being able to trace your ancestry all the way back to the archers of Agincourt then! That’s pretty wow-ish isn’t it. “Once more unto the breach, dear friends, once more”Think..they might have even actually heard him say the words? And then quietly muttered a few tired and choice expletives from under their beards. Thank goodness for the intelligence, wisdom and vision of those who throughout history have commissioned such paintings and artwork to be etched onto so many walls and ceilings of countless buildings across the world for us all to gaze and wonder at for so many centuries to come, and that’s not forgetting the amazing skills of the very artists themselves of course. How I enjoy armchair traveling with the two of you! Beginning with the little red motor car to the jewel box interior of the church of Saint Michael and (the inclusive) all Saints. I loved your description of light streaming through the unadorned windows with views beyond and, best of all, the startling relationship to Monk's house and Virginia Woolf. You never fail to delight and inform. Thank you! Gosh, it really sounds as though you are having something of a hectic time but, we are sure, great fun is being had by everyone. We so enjoyed our visit to Lawn Tea and will certainly look forward to our return as we shall to welcoming you here again. In the meantime, have a lovely time in Atlanta at the wedding. Yes, you are right, the whole day was perfectly planned from beginning to end by Peter and Nigel with a great deal of thought and care. Including, of course, the refreshment stops - an essential and enjoyable part of any day out. It is interesting about Caroline Zoob at Monk's House. A lovely place to be but not exactly quiet with the public traipsing round several times a week!